PET-FB-P9933-23 4.5″ x .75″ White Plastic Key Tag 1000 $18.90 per pkg. 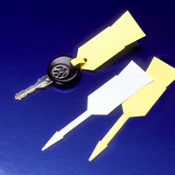 PET-FB-P9933-24 4.5″ x .75″ Yellow Plastic Key Tag 1000 $18.90 per pkg. PET-FB-P9933-98 4.5″ x .75″ Blue Plastic Key Tag 1000 $18.90 per pkg. PET-FB-P9933-99 4.5″ x .75″ Red Plastic Key Tag 1000 $18.90 per pkg. 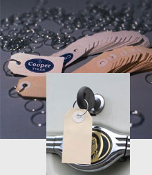 PET-FB-P9833-13 Paper Key Tag with Metal Ring 1000 $47.80 per pkg.